My patient is a 2-year old female/spayed Labrador Retriever who was initially examined 2 months ago because of anorexia and vomiting. Routine serum chemistry panel showed prerenal azotemia, hyperkalemia (potassium of 7.4 mEq/L; reference range, 3.5-5.7 mEq/L), hyponatremia (sodium, 127; reference range, 136-148 mEq/L) and a Na/K ratio of 18 (normal <27). An ACTH stimulation test revealed a low basal cortisol (0.2 μg/dl) with no response to ACTH stimulation (0.3 μg/dl). This lack of a cortisol response coupled with the classic serum electrolyte changes was considered diagnostic for primary hypoadrenocorticism (Addison's disease). I started the dog on oral prednisone (0.15 mg/kg once daily) for glucocorticoid coverage. For mineralocorticoid supplementation, I administered a single dose of desoxycorticosterone pivalate (DOCP; Percorten-V, Novartis) at the recommended dose of 2.2 mg/kg intramuscularly. The dog has done very well, with a complete clinical response. We have monitored the dog's serum chemistry panel at 15, 25, 35, and 51 days after the initial Percorten-V injection, but the dog's serum potassium value remains within the high-normal range (between 4.5-5.5). Now on day 53, the dog is acting more lethargic and is not eating well. I just instructed the owner to administer the second Percorten-V injection; the owner is a nurse so they are able to give the injection at home. I'm confused. Does this dog have Addison's disease or is my diagnosis incorrect? Can Addison's disease ever go into remission? Why is the serum potassium concentration still within the normal range? In answer to your second question: No, dogs with true primary hypoadrenocorticism have destruction of all layers of the adrenal cortex and do not ever go into remission. These dogs require life-long replacement of the missing adrenocortical hormones (3-5). In answer to your last question, I do not know for certain why an occasional dog will have a prolonged response to the Percorten-V injection, but it certainly does occur. Remember that circulating potassium concentrations are controlled by factors other than just aldosterone. That's one reason we sometimes see dogs with "atypical" Addison's dogs that have persistently normal serum potassium concentrations but no measurable aldosterone concentrations (6-9). Most of those dogs will eventually go on to develop hyperkalemia or hyponatremia, but in some dogs it may take months. Dogs like this indicate that there are mechanisms which allow normal potassium and sodium balance to be maintained even without the presence of circulating aldosterone. This phenomenon is also recognized in human medicine, where it has been shown that up to 25% of human patients with primary hypoadrenocorticism may have normal serum potassium concentrations. However, all of these Addison's patients will have a high plasma renin to aldosterone ratio, which indicates a failing zona glomerulosa (10,11). Hyperkalemia itself will increase potassium excretion; this may help maintain normal serum levels of potassium. A high renal tubular flow rate with increased distal delivery of potassium can increase the urinary excretion of potassium and again help maintain normokalemia. An increased sensitivity of the distal tubule to aldosterone will enhance the urinary excretion of potassium. Again, this would help maintain the whole body levels of potassium. Insulin may also act to compensate for aldosterone deficiency by promoting the transfer of potassium from the extracellular to intracellular space, thus maintaining normokalemia. Based on my studies done 2 decades ago, it's clear that most dogs with Addison's disease can be maintained quite well with DOCP when given at much lower monthly doses than 2.2 mg/kg/injection (4,5). In one study (4), the final median dose of DOCP needed in 33 dogs was 1.69 mg/kg/month, with a range of 0.75-3.4 mg/kg/month (Figure 1, below). 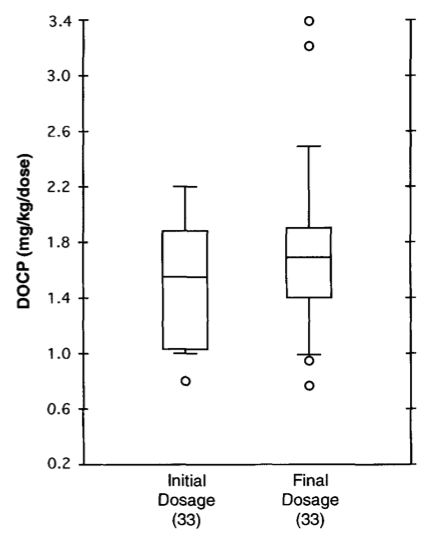 Figure 1: Initial and final maintenance doses of DOCP (Percorten-V) administered to 33 dogs with Addison's disease. Data is displayed as "box plots," in the the whiskers represent the main body of data (i.e., the range). The box represents the interquartile range for the 25th to75th percentile (the middle half of the data). The horizontal bar through the box is the median value. Outlying data points are represented by open circles. If this was my case, I would not waste any more time or money trying to determine the longest interval you can go between Percorten-V injections. Remember, it's not necessary for hyperkalemia to redevelop before the next injection; in fact, you don't want that to ever happen! Rather, I recommend that you treat with low dose of Percorten-V once monthly. It's very difficult to "overdose" Percorten-V, so we don't have to worry about giving the injections too frequently, especially when we are giving a smaller monthly dose. How low can you go with the monthly Percorten-V injections? I'd start by lowering the dose by about 10-20% and then check the serum electrolytes again in a month. If they remain normal, then I'd continue to decrease the dose by another 10-20%. Again, in my studies, over half the dogs did very well on a monthly dose of Percorten-V <1.6 mg/kg. Almost all dogs need a monthly dose of at least 1.0 mg/kg/month to maintain normal serum electrolytes on a long-term basis (Figure 1). Peterson ME, Kintzer PP, Kass PH. Pretreatment clinical and laboratory findings in dogs with hypoadrenocorticism: 225 cases (1979-1993). Journal of the American Veterinary Medical Association 1996;208:85-91. Feldman EC, Nelson RW. Hypoadrenocorticism (Addison's disease). In: Feldman EC, Nelson RW (Eds). Canine and Feline Endocrinology and Reproduction, 3rd Edition. WB Saunders. St. Louis, Missouri, 2004, pp 394-439. Baumstark ME, Mueller C, Boretti FS, et al. Evaluation of aldosterone concentrations in dogs with Addison's disease (abstract). Proceeding of the 2011 ACVIM Forum. Oelkers W, Diederich S, Baehr V. Diagnosis and therapy surveillance in Addison's disease: rapid adrenocorticotropin (ACTH) test and measurement of plasma ACTH, renin activity, and aldosterone. Journal of Clinical Endocrinology and Metabolism 1992;75:259-264. Shiah CJ, Wu KD, Tsai DM, et al. Diagnostic value of plasma aldosterone/potassium ratio in hypoaldosteronism. Journal of the Formosan Medical Association 1995;94:248-524. Harvey TC. Addison's disease and the regulation of potassium: the role of insulin and aldosterone. Medical Hypotheses. 2007;69:1120-1126. Gagnon RF, Halperin ML. Possible mechanisms to explain the absence of hyperkalaemia in Addison's disease. Nephrology, Dialysis, Transplantation 2001;16:1280-1284. I am a member of a dreaded online Yahoo support group for Owners of Dogs with Addison's Disease, called Addison Dogs. Our group has more than 5000 members with 1 or more Addison Dogs. I am not a Vet but we do have vets who are members of our group. Some have Adogs of their own or some just coming looking for information for their practice. We even have a few who contribute to the group. In our group we see many dogs with the prolonged response to percorten when the dose is started at 1mg per lb. The longest I have personally seen a dog go on the initial dose of percorten was 101 days before lytes verified the dog required more. We see from 10 to 25 newly diagnosed dogs a week on our list and about 25% have prolonged response to percorten. Even dogs without prolonged response are able to have their dose of percorten reduced significantly over the first year of treatment. Seeing dogs on less than .5mg per lb is not uncommon at all. Convincing Vets to reduce the percorten dose in response to lytes testing is actually the difficult part.. I don't have "published" data to back this up just my experience seeing several thousand ADogs being treated. There is also a low dose percorten study being published soon. Our group also now keeps records of the doses of percorten by weight in a database and while not scientific it does show that low dose percorten does work. When you consider how expensive percorten can be reducing the dose in response to lytes testing makes percorten treatment much more affordable. If more Vets would actually start percorten off at .75mg per lb it would go a long way to finding the lowest effective dose sooner. Thanks for allowing me to comment. Thanks for helping to get more info out there on Canine Addison's. I agree that most dogs with Addison's can be controlled on a monthly dose of Percoten-V that is between 50-75% of the manufacturer's recommended dosage. As a dog-mom of one of those A-Dogs currently thriving on a lower Percorten dose, (1ml/mo. for an 80 lb, 8 year old Yellow Lab, plus 1mg of Pred daily), I delight in any discussion on the subject of starting lower with Percorten and/or weaning down for dogs with Addison's. Thank you for the great info on Canine Addison's and lowering the percorten dose. It makes such a huge difference to our dogs. I wish I had had access to this info when my dog was diagnosed at 1 yr of age. Percorten was not available in Canada then ( it is now thankfully ) and using florinef was a rock road for us. Percorten is a miracle drug. I will be sharing your article! I am also a member of the online support group AddisonDogs. I have two dogs with Addison's-one diagnosed in 2004 (and started at the low end of the recommended starting guideline) and one we adopted knowing he had AD. My 86# ADog is thriving on .7ml of Percorten every 28 days and my 43# girl gets .8ml. Just goes to show every dog is different but both are on much lower doses than most vets think can work. Most problems I see with our almost 5000 members are getting vets to check electrolytes and base dosing on the results and prescribing therapeutic versus replacement doses of pred. Thanks for discussing canine Addisons-knowledge is power. Although it's long after this article was posted, I'm just seeing it for the first time now. Dr. Peterson, prior to this blog post, I brought my Addison's dog, Mac, to see you for a consult. We live in another state, so regular visits weren't an option. I'm so happy to see that you've had experience with low-dose Percorten & that you believe it works. 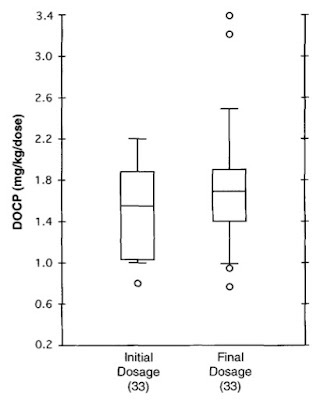 There is a study that's been accepted for publication that shows you can safely start dogs on half or slightly less than half of the standard 1 mg/lb dose & then you can reduce from there based on the electrolytes. This has helped Mac feel so much better. When he used to get too much Percorten, his potassium would be pretty low. When it's low - even if it's in the low-normal range - Mac has less energy & stamina. Back then, Mac would always come in last place in a dog race with his brother & his friend. He's now on 0.55ml & he's about 65 pounds. Now, his brother & his friend are chasing him & having a hard time keeping up! Mac is a different dog on low-dose Percorten. He's also much, much better on less Pred. He's down to 1mg daily & we may still be able to reduce it a little bit further. I'm so happy to have stumbled across this! My understanding is that there are many, many dogs out there following low-dose Percorten & it really works well. Thanks! I agree that we don't want to serum potassium to be to low, so that's a good reason to lower the Percorten dose. In addition, as I've discussed on other blog posts, many Addison's dogs are overdosed on prednisone/prednisonlone. Most dogs will do better on daily doses of 0.1 mg/kg/day or even less. Some dogs do well on every other day pred, etc. I've not seen too many dogs be well controlled on monthly doses of 0.5 mg/kg of Percorten (that's roughly what you are giving Mac). But as long as you are monitoring serum electrolytes and renal function, there is absolutely no "lower limit" to the drug dosage. We must administer only amount of drug that is needed to replace the missing hormones -- no need to give so much more. My 9 year old Lab was diagnosed with Addison's this summer and is doing well on percorten after having been on florinef for the first few months. I am having difficulty figuring out how much prednisone to give. His weight is 67 lb and he was panting terribly at night - even waking himself up with a respiratory rate of about 140/min (!). I couldn't figure out if it was from too much or too little prednisone. I now have him on only 1 mg a day but he is a little subdued. If I increase the dose, his panting is worse. Any suggestions on improving his "mojo" without increasing the night time panting? Most dogs do well prednisone or prednisolone at the dosage of around 0.1 mg/kg/day. So that calculates out to around 2.5-5.0 mg each day. If a dose of 1 mg is causing your dog to be lethargy, that makes sense — that is a very low dose. If the panting is caused by the prednisone, then you might be better off with a different glucocorticoid preparation. Talk to your veterinarian about switching to either methylprednisolone (2 mg per day) or cortisolne acetate (12.5 mg twice daily). If you don't have an xray or ECG, your vet may want to do that, just to rule out concurrent lung or heart disease. Dr. Peterson the Study, "Lower initial dose desoxycorticosterone pivalate for treatment of canine primary hypoadrenocorticism" has now been published by Dr. Julia Bates, DVM, DACVIM. My own dog is one that is using low dose Percorten, he currently weighs 75lbs and takes 0.5ml every 28 days. He started on florinef and required ever increasing doses so we switched to percorten. He was stable on 1ml every 28 days for more than 3 years and then his K dropped low enough he was having side effects. Over the next few months his dose was reduced to .5ml and his lytes and kidney function are perfect. I have an 11 lb. 10yr old male Terriercross of somesort. 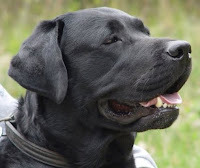 He overdosed on his cushings medications in August 2013 and went into Addisons crisis. It was a near death experience for him. He is also diabetic. We have spent the last 3 months stabilizing his Addisons and Diabetes. Currently he is on 2.5 tabs of Florinef 0.1mg BID ( as well as 5.6 units Vetsulin BID). This Florinef dose has had to be continually increased by approx half tab BID every 3 weeks to keep his electrolytes within proper ratio and range. We may have to increase it yet again, I do not know that it has stabilized completely yet. With guidance from Elizabeth and others from the Addison supports groups, it has been strongly suggested that I transition to low dose Percorten in order to stabilize Murphy's electrolytes permanently and quicker and to avoid him getting more steroid than he actually needs in the Florinef. The steroid component is what is important to me. I do not want him getting more steroid than he needs, in order to avoid negative long term effects. He shows no signs of too much steroid at this time. Would you suggest switching to low dose percorten at this time or staying with Florinef as my dog is finally somewhat stable and feeling good. Is the steroid in Florinef any less hard on them than the prednisone? I would definitely get your dog off of the florinef and replace it with the Percorten-V. A glucocorticoid is a glucocorticoid-- it makes no difference to an Addison's dog if this activity comes from prednisone or from the fludrocortisone (Florinef). If you are having problems controlling the serum electrolytes, I would not start with low dose Percorten. Rather, I'd use a higher initial dose until stable and then lower the dose, if possible. It would seem my Great Dane may need a dose adjustment. He's 2 yrs old and 155lbs, was diagnosed with addison's as a puppy under 1 year. He is consistently going 3 months between percorten shots before indicating he needs more. Also on 10mg prednisone daily. My major concern is that he seems to be losing his fur - his coat has thinned out and is patchy on his rear end. Belly and lower legs have very little fur. Our Vet checked him out and thought the coat problem could just be part of his disease. I'm wondering if this can be an indication of too much percorten vs. prednisone? Each time I try to bring down the pred dose his appetite goes off and he won't eat his food. He's been getting a full 4ml vial of percorten every 90 days which I think was recommended dose for his weight at the time of injections (around 140lbs). I dropped it 20% with the last injection and 2 months later he has a normal blood test. Any recommendations would be greatly appreciated. thank you! At 10 mg of prednisone a day, that amount of glucocorticoid is too much (twice the human maintenance dose). Given chronically, that can certainly lead to signs of iatrogenic hyperadrenocorticism (Cushing's syndrome), which is caused by too much glucocorticoid drug administered. Signs of iatrogenic Cushing's syndrome include hair loss, thin skin, and enlargement of the abdomen. With Percorten-V, I find it best to continue to give the drug at least every month or so, but to try to lower the monthly dose if we can based on serum sodium, potassium, and chloride concentrations and kidney values. 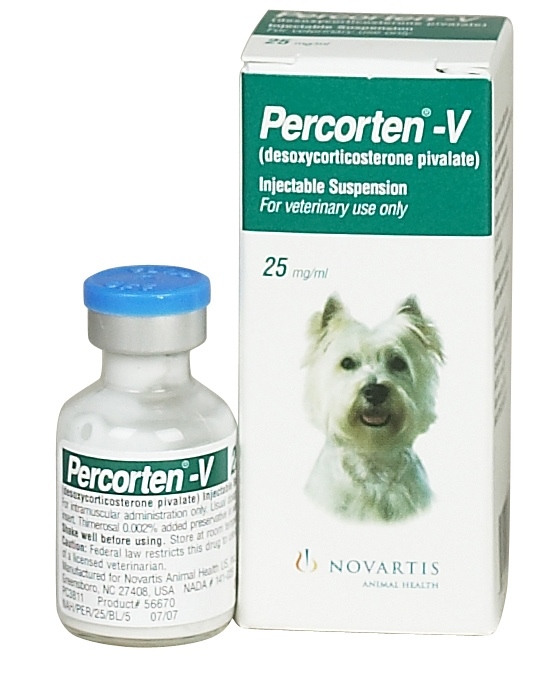 Pharmacologically, there is no way that the Percorten-V can be maintained in a dog's body for 3 months, so your dog likely has little to no mineralocorticoid in his system. Even if the serum electrolytes are normal, Percorten should be given at around monthly intervals, once we prove that the diagnosis is indeed true primary Addison's and life-long mineralocorticoid supplementation will be required. The poor appetite is troublesome. This could be due to the lack of Percorten-V but could be also due to something else going on with your dog. In any case, this should all be investigated. Simply increasing the prednisone will cover up the problem and may help the appetite, but in the end, is really only doing harm. Dogs with Addison's should never require this much prednisone on a long term basis in order to maintain a normal appetite. My 7 year old pug was diagnosed with Addison's three years ago. He is 13lbs. He was stable for a number of years on 0.5cc of Percorten. Last summer he developed increased thirst and urination, so his dose was decreased to 0.3cc. He improved until a few months ago when the sx recurred. I recently increased him back to 0.4cc to see if the sx improved, but they have not. I don't know if his dose is too high, too low, or unrelated to his symptoms. Please help! I would appreicate any input you could provide. The Percoten dosage is based upon determination of serum electrolytes. In general, increasing or decreasing the dosage should not affect the thirst. Talk to your veterinarian about monitoring the serum sodium, potassium, chloride and renal function. Thanks very much for your reply. His electrolytes have always been normal since initiating percorten. My 5 year old toy poodle, Bailey, was diagnosed with primary Addison's on February of this year. She was started on .4cc of percorten, but dropped down in March 10% to approx. .35cc because her potassium (K) level was staying at 3.8-3.9 and the vet wants her at the mid-range which is 4.15. We are now on day 49 of percorten and Bailey is still at 3.9 for her K. My vet believes in low dose percorten, but she is recommending I wait three weeks more and see if Bailey's K will come up to that mid-point range or we see signs of the beginning of a crisis, then she said she would give her the injection, but drop her to .3cc of percorten. I don't want Bailey to go into a crisis! What would you do? Do I take her back in now and request to have her lytes tested again and no matter if her K is still the same (3.9), we give her the percorten but definitely at .3cc or less? FYI...Bailey has not been herself since this started. She eats fine, stools are good, but her energy level is down (not peppy like she used to be) and she has gained almost 4lbs. Also, she is taking .7 mg of liquid prednisolone once a day. Thank you for any advice you can give me. My vet is not sure how to handle this either. As noted in this blog post, a dog can maintain normal levels of potassium despite no mineralocorticoid secretion. 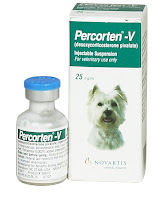 I like to treat dogs with Percorten once a month, at a low dose (around <1-1.5 mg/kg in most cases). It is almost impossible to create hypokalemia at that dose. Withholding Percorten for weeks will guarantee that the dog will not have enough mineralocorticoid in the circulation. For pred, I use the smallest dose possible, generally around 0.1 mg/kg/day. To much or little Percorten or pred could cause lethargy - much of this is trial and error. My 14 year old dog has Addisons, and has been doing well since diagnoses in early 2014. She has an injection of Percorten every 24 or 25 days and prednisone once a day. I forgot to take her in yesterday (day 24) for her injection of Percorten and now she will need to wait until day 27 (Monday) when the vet is open again. Will she be ok? Your dog should be fine. Our 8 year old toy poodle has Addisons,she was diagnosed 5 days ago. She was given her 1st Percorten injection yesterday. Also on prednisone 5mg. 1/2 tablet in am. The problem is she drinking and urinating a lot. Would it be safe to cut the dosage of prednisone back? She is 9 pounds. The calculated maintenance dose of prednisone for a 9 pound dog would be 0.4-0.8 mg per day, much lower than the 2.5 mg you are giving now. That could certainly explain the increase in thirst and urination. I'd start by cutting the dose in half and see how she does with the appetite and attitude. I have an 8 year old ADog, poodle, 30 lbs. he recently had an ACL strain, gastric upset (ate nothing for 3 days, now great on Pepcid BID) and a new pup in the house. So he is stressed and I upped his daily prednisone from 0.5mg to 0.75 mg to help. He was due for Percorten 1 week ago but his Na/K was 32, both right in the middle. 2 days later, K was down and the ratio was 47. Today the K remains down but Na is also down so ratio is 37. Na is approaching the lower limit of normal. K not elevated at all. So do I give Percorten? Usually 0.75mg. The blood draws were clean. We don't determine if percorten is needed only on the basis of a low sodium or high potassium. If you and your vet are positive about the diagnosis, I would give the injection. Thanks. ACTH test did confirm, so will do. My vet just told me from the blood test he thinks my dog has addisons but he's not sure yet. I already had a dog with Addisons and I still have some percorten left over. He said not to jump the gun and give my dog percorten and just go with the pred until he knows for sure. The thing is she won't eat anything and keeps throwing up the pred. I'm thinking about just giving her a shot of percorten to see if it helps. My question is could I do harm to her if I give her the percorten but then she ends up not having Addisons? Only 2 dogs I ever owned and they both end up with addisons! What are the odds! It won't hurt your dog to give one injection. But if the serum electrolytes are normal, I can't see how it would help either. Dr. Peterson, I just got done reading your article and it's very insightful. As Elizabeth and Debbie brought out from the Addison Dog Group, this is valuable information that all A Dogs and vets should research to make them more knowledgeable to their dogs and patients. Our Basset Hound Charlie is 3 1/2 years old now and was diagnosed with Addison's when he was 2 years old and Addison Group was a tremendous help getting Charlie on a low dose Percorten plan. He is now 69 lbs and takes .8mg every 30 days and he is due for a shot on Monday 4-4-16 along with electrolytes to see how he is doing. He also only takes 1.25 MG of Prednisone each day and he is a very active dog and still has a great appetite. I still would like to see Charlie drop to .6mg on the Percorten shot but my vet doesn't want to go that low. I will see how his appointment goes on Monday to see what she says. Again, great article and insight. If anyone still hasn't joined the Addison Dog Group, I highly recommend it since you will hear individual stories each day of other ADog owners going through the same thing we all go through but we love our dogs and we want the best for them. Thanks Elizabeth and Debbie including the whole Addison Moderator Group for all your hard work and Dr. Peterson for bringing this up on his forum. My 13 year old daushaund spaniel has had addisons since she was 4. She started getting seizures last month. I noticed the two seizures are right around the time of her due precortin injection. Lab work revealed high liver counts. Sonogram didn't reveal tumor or cyst. We are holding off on liver biopsy. Could her seizures be related to her Addison's disease or is this just a coincidence? Just seems like the timing of her seizures are around the time she needs her precortin. Thanks for your help. No, seizures are not seen either with Addison's or Percorten. With my dog it was the Prednisone that made her tired. I backed down the Prednisone until I stopped giving it and she's doing much better. Dr's give out prednisones like candy but it is nasty stuff for humans and animals.